For hand tapping in maintenance and repair work and for re-threading applications where extreme thread accuracy and tolerance is not critical. Taper Taps: Distribute the cutting load across 7-10 threads. Used for starting a threaded hole. Plug Taps: Most commonly used, distribute the load across 3-5 threads of chamfer. 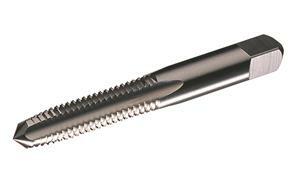 Bottoming Taps: Have only 1 to 1-1/2 threads of chamfer and are used to tap to the bottom of a blind hole. 186 items. | Page 1 of 8.